Finding time to read more books has got to be one of the most popular New Year’s resolutions. We make a big list at the beginning of the year of all the books we will read this year. Do you find yourself with a book stack to the ceiling but have trouble finding the time to read them? Reading is like breathing for me. Bookstores are my Disney World. I can always tell when I’ve gone too long without reading a book. It’s hard to explain the energy and ideas that flow when reading a book, fiction or nonfiction. But making the time to read isn’t an easy one, especially when you have children….that are home all the time. While, yes it is my choice to have them home all day that doesn’t mean I don’t daydream about staying in bed all day with a big stack of books. Of course, that’s happened absolutely never, but a girl can dream can’t she? So since I’m years away from a quiet house and lots of time on my hands, I’ve had to make room for reading to happen in my life so that it will happen. Because no matter how busy you are, we are always able to find time for the stuff that really matters. Here are some tips to help you read when you don’t have a lot of time and have a very busy household. My goal is always to get up before the kids. There are many times when that doesn’t happen but they are usually able to preoccupy themselves for a little while. Reading first thing in the morning, even if it’s just for 5 or 10 minutes will allow you to feel good about getting reading it, especially when you don’t know what the day has in store. Read right before you go to bed. There are some nights when I can barely crawl into bed, but if I’m reasonably awake I will again take another 5 to 10 minutes to read before I turn out the lights. Doing this little thing for myself twice a day can really be a sanity saver after taking care of everyone else for the day. Have books within an easy reach. I usually read more than one book at a time. I love learning all kinds of things and so reading more than one book at a time cures my quest to learn. I leave books around the house. In my room, in my office, in the dining room, on the tables in the living room. This allows me to easily pick up a book if I find myself with a few minutes to fill, like waiting for someone to come to the table or making dinner. I always tell myself that I don’t look at my phone very much. But the truth is, those little minutes we think don’t count can actually add up to a big chunk of time. This is also where having books in different places will help you to read. Instead of pulling out your phone, you can pick up a book and read a couple pages instead. Try picking up a book when you are tempted to use your phone and see how quickly you can get through a book. Read books on your phone or tablet. I love reading a physical book. I love the feel of holding the book in my hands and the smell. Sometimes, however, it’s so handy to read on your phone. I will bring books with me in the car just in case I would have a couple minutes and it’s always kind of a pain. In fact, I will talk myself out of it because I think I won’t have the time and I don’t want to go through the trouble. Then I always do and I regret not bringing the book. Well, having books on your phone makes that soooo much easier. They are always with me. I will be honest. I’m not much of an audiobook fan. I really like the idea, but the truth is, I will try to multitask when listening and then I don’t pay attention. It may be a great option for you. I suppose if I listened when I go for a walk or bike ride, I would probably have an easier time. Reading is such a great way to get some me time. Making time for reading also allows me to do something for myself. 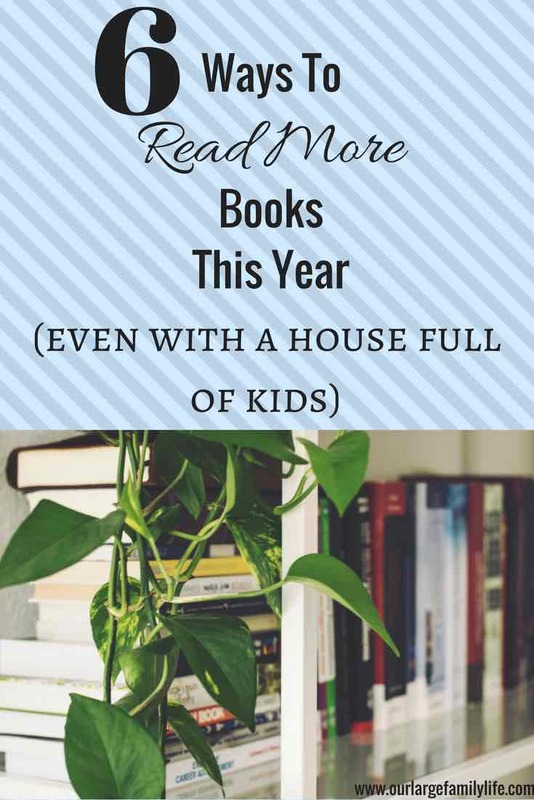 I read plenty to the kids all day long, but when I pick up books that are just for me, I am able to recharge and learn more about who I am and what I am interested in apart from being wife, mother, cook, chauffeur……. I would love to know how you fit reading (or anything you are interested in) into your day. Let me know in the comments below! I have to read before bed, fiction only though after my little devotional book!